ESCAPE From Corporate America! 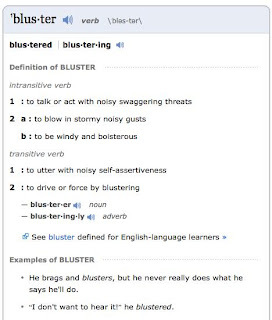 : Bluster or Blowhard? Must Women Entrepreneurs Learn to Bluster? 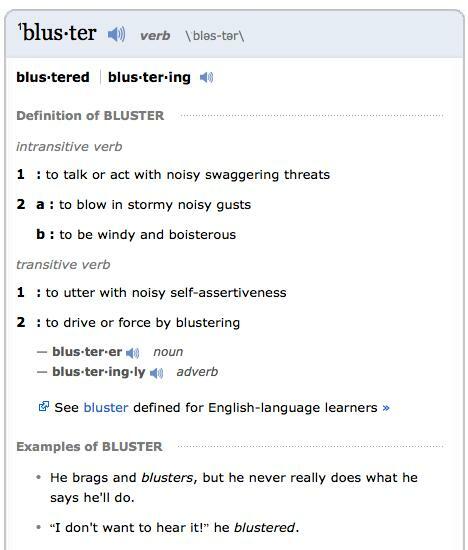 Truth be it, I had to look up the word to figure out what it meant in the context in which it was being used because I only thought of bluster as "a fierce wind blowing!" But take a look at the definition above, especially how the two examples referenced are from "men." And don't miss the word "blowhard" either because they might be interchangeable. Camille Alcasid, a software engineer who runs Santa Monica, Calif., new media consultancy Westside Websites, says she routinely experiences the double standard. "Men can get away with bluster because it is more accepted or expected in society and in the workforce, while bluster is sometimes confused as noise when not properly executed or received," she says. Working in a male-dominated field, she says, "I've come to learn some of the tricks men do to cover up for what they don't know and how they expose or conceal their flaws and strengths, depending on the situation." Ladies ... What do you think? Can you muster up the bluster? Or should you bother?